An iconic landmark etched upon the South Bank skyline, the Channel Seven Wheel of Brisbane is a breathtaking way to take in views of Brisbane City. Rising 60-metres above South Bank you will enjoy spectacular 360-degree panoramic views from the safety and comfort of a fully enclosed, air-conditioned gondola that seats up to eight people. The Wheel is located the heart of Brisbane's cultural and entertainment precinct and is just a five-minute walk from South Brisbane buses and trains. 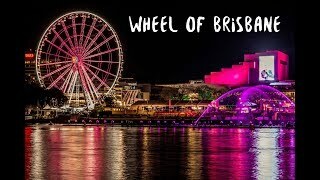 The Channel Seven Wheel of Brisbane provides an unforgettable experience for young or old, tourist or local and includes up to four revolutions on your 10 to 15 minute ride. With a magical stop at the top and an engaging audio tour pointing out popular Brisbane landmarks, it's a must-do activity for all. Visitors can experience the Wheel a few ways with sights by day, lights by night, sunset rides or by enjoying a Sky High Picnic on board with options for both kids and adults. There are also birthday and romantic experiences you can book for your loved ones as well as a range of Sirromet wines. Check out your photo memories and other memorabilia when exiting the Wheel too. Child $14.50 - $14.50 Children and infants 3 years and under ride free of charge. Indicative Prices $14.50 - $22.00 Adult AUD22 Concession / Students AUD18. Child AUD14.50 Family (two adults and two children 11 years and under) AUD64. Three years and under ride free.